Being blind does mean we do like to operate within a comfort zone. I love to get out and about, go for a coffee at Starbucks. Ride the bus and the train. Be independent. Then some city planner decides to throw a spanner into my comfort zone. Close a street to rebuild it for car access, rebuild a bus route to accommodate a new route for a high speed train which may never appear. Move my bus station from the main streets of Fresno to the back streets. Earlier this week I made a trip downtown to purchase my monthly bus ticket. Arriving down town another passenger made a comment about fencing around one area of the bus stops. At the end of last year they moved my usual drop-off point across the park now it appears the pick-up area is enclosed by yet more feencing. The whole of downtown Fresno is an obstacle course of barriers, wire fences and diversions as a new downtown construction plan is put into place to accommodate a new high speed rail link which may never happen in California. 'Have they closed the Northbound stop? " I asked the driver. "Yes." she said. "The new stop is over on Merced and L Street." Great I thought. Having no idea where Merced and L streets even were. But luckily the transit people had placed some helpful people on the street to guide the lost passengers. Well finding one of these people was fun, wandering like a lost soul up and down asking any passing shadow. Eventually I found the correct person. ""Turn right, one block on the left." She said. 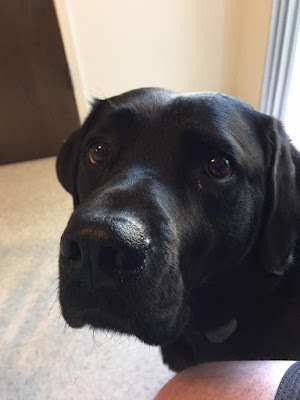 OK so Leif my guide dog and I set off. Right was easy. Down one block and the street was silent. I turned left and crossed the street. Thinking funny now I might be going the wrong way. The street was deathly quiet. Just the distant rumble of traffic but nothing on the street where I walked. Eventually I came out onto another main street. I must have missed the new stop. I made my way back following my previous walk. Back to the street which I had crossed. I crossed back and walked up the street again silence, no cars or buses passed me. I eventaully moved onto another busy cross street. "Bugger it!" I muttered to Leif. I know where there is another bus stop from here so we walked three blocks over and found a bus stop near to the public library. In minutes my bus came and we were on our way home. 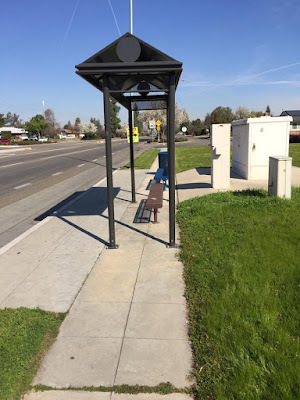 What to do to find the new bus stop? Well the solution for me was easy. If all else fails get to ride the full bus route. I did just that this morning. The two hour ride took me to all parts of the town. But finally as the bus looped back towards home. We turned up the quiet street where I had first walked down, to the street where I had crossed we turned left, the bus travelled half a block and the driver pulled over in front of the only building on that side of the block. Beside a lonely quiet parking lot. There we were at the lost bus shelter. Not exactly where I had been told. Life is tough being blind and you are forced to work outside your comfort zone. But life would be easier if sighted people please gave clearer directions.